Get ready for long lineups outside baseball stadiums again this summer thanks to a big lineup of bobblehead promotions. Currently, 98 bobblehead giveaways are planned for the 2013 MLB season (the Red Sox and Astros haven't published their giveaway promotions yet). 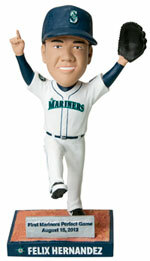 For years, these promotional baseball bobbleheads have been wildly popular on the secondary market. Their limited availability make them tough to track down, although the Internet has made it easier for those who live out of town or couldn't make it to the game. 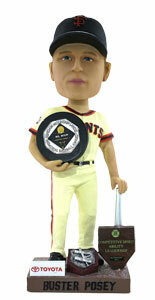 The 2013 bobblehead season kicks off in Milwaukee on April 6 when the Giants are scheduled to immortalize catcher Buster Posey with a commemorative National League MVP bobblehead. One of the likely most anticipated giveaways of the season comes a week later when the Angels give their fans a Mike Trout bobblehead. Some of the other notable 2013 MLB bobblehead promotions include Nolan Ryan (May 21), Felix Hernandez (May 25), Yu Darvish (June 11), Sandy Koufax (June 27), Ken Griffey Jr. (August 10), and Miguel Cabrera (September 17). New Dodgers owner and basketball legend, Magic Johnson is also getting the bobble treatment in 2013. Baseball's marketing departments have come up with some strange bobblehead stadium giveaways as well. The Brewers are giving away a Polish Racing Sausage. Not to be outdone, the Royals have Ketchup, Relish and Mustard scheduled for three different games. Tampa Bay Rays mascot, Raymond, has a bobble-belly giveaway in September. The most interesting 2013 MLB bobblehead giveaway is on July 5 when the St. Louis Cardinals celebrate broadcaster Mike Shannon with a bobblehead that comes with a voice chip. Think of how annoying that could sound if everyone in the stadium activated them all at once. Just like last year, the Dodgers lead with the most bobblehead promotions in 2013 with 11. Milwaukee, with ten, is second. The Rockies are third with nine, although none of the names have been announced. Colorado is going with a 20th anniversary theme. Below you'll find a calendar of all 2013 MLB bobblehead promotions. We've included the date, player (where available), special details or themes, restrictions and limits. May 4th – Billy Butler. Alright! Lead off with the veteran, now let’s see the young stars in the following months. Moose, Hos, Sal, and Esky. Incase you are wondering the August 21 Philadelphia Phillies Cole Hamels bobblehead is to all fans, not 14 and under, for any fan that’s wondering! I found a LA Angeles nodder head in old family storage. It has no player name or number. The blue cap with red bill has LA on the front, Angels across white jersey, white pants, blue belt and under shirt, blue shoes, white round base with Los Angeles written on the edge with yellow background under the lettering. There is a magnet on the bottom on the base. The player has a smile with teeth showing and brown hair. I haven’t found one like this online yet. Can you give me any information? 2012 JIMMY ROLLINS OLD SCHOOL BOBBLEHEAD READING PHILADELPHIA PHILLIES SGA NEW!